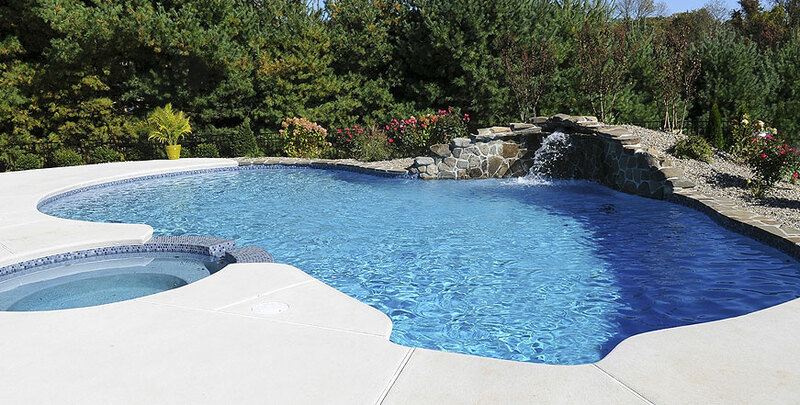 Over time pools and spas become stained or saturated with chemical residue. The plaster surface must be cleaned. During cleaning, too much chemical can significantly reduce plaster life; too little chemical and the purpose of the cleaning is defeated. We drain the pool, use the right amount of chemicals, wash and rinse, then refill. The pool water must be free of visible and invisible dirt. Visible dirt is generally removed by the pool filter. Invisible dirt is made up not only of bacteria, which can multiply very rapidly and cause problems, but also algae and fungi of various kinds which spread to the pool, where they find the conditions pleasant. Chemical agents are used to combat and control these. To assure the water in the pool is crystal clear and clean, it must be chemically treated. Pools in Southwest states are different from their counterparts in the Midwest and East Coast in that they remain uncovered year-round. As such, they must be regularly cleaned and maintained chemically. Why you might ask? Because in the long run, it is more economical to leave the pool uncovered as opposed to covering it over and winterizing the equipment. The realities are that winter season in Southwest states is very short. Therefore, with a little additional heating a pool could be used 9-10 months out of the year. Every year in Las Vegas (NV) outdoor swimming pools have to be cleaned and prepared for the bathing season by their owners.In this article Quality One Pool Management (Las Vegas, NV) System Professionals provide information and outline the pros and cons of the chemical cleaning methods for swimming pools. Municipal water used to fill pools is generally potable water intended for drinking, not for swimming. While there are certainly similarities between the two, swimming pool water must be adjusted chemically to provide more robust protection against bacteria and microorganism that have a potential to proliferate around any water body. A swimming pool should be cleaned not only from the onslaught of debris, but also for preventative measures to address algae growth “slime” at the bottom and walls, pathogenic organisms, chemical as well as organic contaminants. — The water is a relative neutral pH (acidity level) of about 7.2 to 7.4. Maintaining this level maximizes the process of chlorine sanitization and oxidation. Pool Water Treatment includes Mechanical, Chemical and Electrophysical. Mechanical cleaning, is performed utilizing nets, brushes, special vacuum cleaners and filtering devices. Its purpose is to remove any initial algae formations, or debris such as leaves, sand, dust, dirt, plates, straws, cups, papers, etc. Vacuuming cleans and also helps support the circulation by moving chlorinated water throughout the water body. By moving chlorinated water into poorly circulated areas, bacterial growth is less likely. Chemical cleaning is utilizing chemicals to oxidize oils and films and disinfect any bacterial growth such as , algae. Proper chemical control also stabilizes pH to a near neutral level and removes unpleasant odors. In some instances, particle debris is so small that it must be collected together through the use of a coagulant and then processed through the filter. Other water treatment processes include electrophysical methods or without chemicals (UV irradiation, ozoning, electrolysis; ultrasound; ionization by silver and copper ions). Unfortunately, these methods are generally considered a secondary sanitization process. Is the most popular pool water disinfectant. robust protection against fungi, viruses, bacteria and algae. The disadvantages include the need for accurate calculation of the dosage and the fact that heavily chlorinated water can cause dry skin, allergies, or even mild alkaline burns. Bromine disinfection is appropriate for small pools. It does not invoke unpleasant odors and only slightly yields to chlorine in cleaning water from microorganisms. Water with bromine additives is anti-allergen; bromine does not form toxic derivatives, so this treatment is suitable for children’s pools and medical institutions. Disadvantages: bromine is ineffective in large pools, sunlit areas and is relatively expensive. Gives good results, suppresses the propagation of algae, has a disinfectant effect which is, however, short-time. Gives the water a pleasant, clarity, and color. Unfortunately, it is underactive against bacteria and viruses; its doses should be carefully calculated and never exceeded. Overdose can make water poisonous, and swallowing it can be extremely poisonous for humans and even cause death.